Last month Kaspersky set up a unique social experiment – looking at exactly what price people put on their personal mobile phone data in the modern day. The internet security firm set up a pop-up shop with artist Ben Eine in Old Street, but only allowed visitors to buy merchandise by giving away mobile phone data (data dollars) instead of currency, such as WhatsApp messages or personal photos. 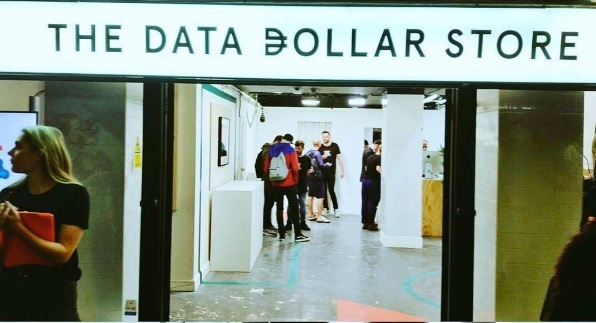 Customers queued from the early hours to get their hands on exclusive prints but in a twist to how the artwork could be purchased, reacted with initial surprise but a willingness to give up their own valued personal pictures or video in payment for the merchandise, heralding the rise of the Data Dollar currency. Kaspersky Lab aims to raise awareness for the actual value of data with this shop opening and is appealing to other market players to join in this effort by using the Data Dollar symbol. As the amount of personal data continues to grow exponentially, consumers could be sitting on a gold mine of valuable currency that holds value regardless of geographical location or affected by currency exchange rates, but are often not aware of it. The lack of awareness around the actual value their data has, is a massive obstacle in making people understand why they should protect the data, says Kaspersky Lab. They hope Data Dollars will raise this awareness and thus make everybody’s online experience more secure. Kaspersky Lab demonstrated how data as a currency could work in a two-day pop-up shop in London. The store attracted shoppers desperate to get their hands on exclusive prints and artwork by renowned Street Artist Ben Eine. All seemed fine for a normal retail experience – browse through the products, pick your favourites and take them to the counter to pay. However, when customers were asked for payment, it was not for what was in their wallets. Instead, it was for Data Dollars – the new currency created by Kaspersky Lab that consists of a customer’s personal data held on smartphones: images, video or texts. David Emm added “It’s easy to forget about the vast amounts of data we share on a daily basis. The feeling of loss if it is taken away against our will becomes much more real when someone is actually physically taking your phone and deciding which data to take. This effect has been an interesting area to explore with the Data Dollar Store. According to a global survey, while 29% of people worldwide have become victim of a cyberattack, 39% leave their devices unprotected from attacks.